This Arbor Day take a few minutes to plant a tree or care for trees in your community. Here is a story of a young man years ago that took the time to plant a few seedlings. It is just amazing what one person can do just over a few short years, makes me wonder what can be done if we all took a few minutes just one day a year. 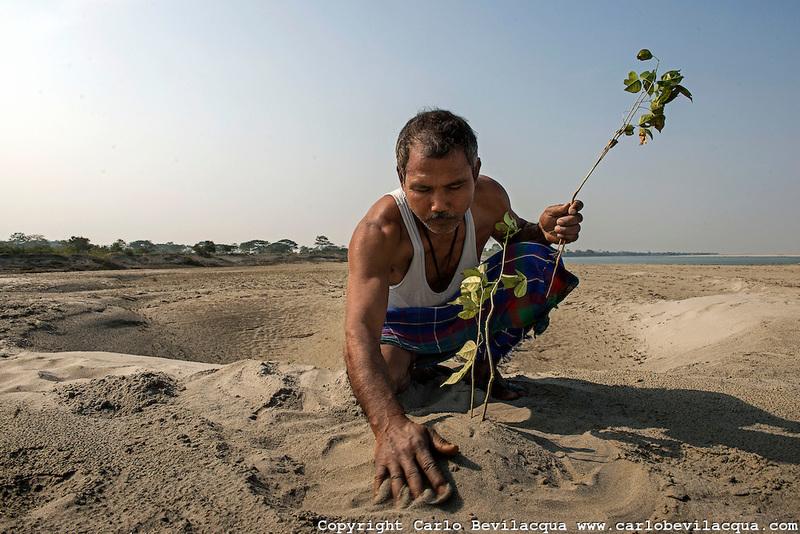 In 1979, a 16 year-old Indian teenager named Jadav “Molai” Payeng planted twenty bamboo seedlings on a sandbar of the a Brahmaputra river in India. Molai was working as part of a reforestation project which lasted five years. Molai, however, chose to stay after the completion of the project and continued to plant and tend hundreds of trees over the course of the following decades. There is now a forest covering 1,360 acres were previously there was none. The forest has been named “Molai Forest” in honor of the man. It is the home to tiger, rhinoceros, apes, deer, and many birds. A herd of elephants also visits the forest every year and birth their calves there. You don’t have to be a tree-hugger to appreciate trees or to celebrate Arbor Day this Friday. They shade us from the sun, feed us fruit and nuts, fill our lungs with oxygen, increase the value of our homes and so much more. We encourage you to take a few moments and visit the National Arbor Day Foundation website. Arbor Day is April 28, 2017. There is NOTHING like fall in Minnesota! Farmers are rushing to get crops out of the field. …or are they?! The Spronk family has enjoyed sharing their field maze for 4 years now. Using production-grade agriculture software, Seth Spronk has refined the art of maze mapping. This year’s maze is in the shape of the state of Minnesota, complete with its 87 counties, covering 6 acres. Spronk Family Corn Maze, by Edgertorn, MN. As published by the Pipestone County Star ~ The rural Edgerton land used for this project is owned by Seth’s uncle, Leon Spronk. This year it took 3.5 hours to cut the maze (down 70 percent since the first year). Inspiration for the project – Southwest Minnesota Christian School’s Pumpkin Festival planners posed the challenge. This will be their 8th year! The maze includes Minnesota trivia questions, pointing visitors to places (counties) within the maze. For more information about the maze or to pre-register, visit www.rockriverpumpkinfestival.com or call 507-442-4471. Watch the website for Medallion Clues! 11:00 am – 4:00 pm – Carnival Games, Vendor Fair, Paintball, Petting Zoo, Hay Rides, Horse Rides and more. MVTV Wireless is proud to serve the community of Edgerton, MN! Coming home from the Blandin Foundation Border-To-Border Conference in Duluth last night, there it was. One of the first combines, working away as most of us are enjoying an evening meal in the comfort of our homes. Whether it’s corn, beans or beets (see the Daily Globe article on U.S House Of Ag visit to one of our local beet farm operations).. harvest safety is always a concern. As published by our friends at the University Of Minnesota Extension… Here are a few tips and reminders to help keep yourself, family and our community safe. Do not expose children to hazards. Teach them farm safety at a young age. Children watch everything you do. If you put yourself in a potentially hazardous situation then they will think it is ok, mimic you, and bad things will happen. For example: When I was a kid we would bring heifers in from the back pasture which goes around the manure pit. My dad taught us to stay about 30 feet or more from the edge of the manure pit because of the deadly gases and obviously so we wouldn’t fall in. To this day, I cannot bring myself to go any closer unless I absolutely have to fix the fence or something similar, in which case someone else is always nearby. Explain to a child the importance of WHY and HOW they should or should not act around machinery or other farm hazards. If you teach them right when they’re young, it will stick with them for the rest of their lives. One seat, one rider. If a piece of equipment only has one seat, the driver’s seat, then the driver should be the only one on that piece of machinery. The only exception to this rule is if a tractor or combine has a buddy seat that is meant for an additional rider. Children love to go for rides but be strict and say NO if there is only one seat. Tough love keeps your kids safe. Always tell someone where you are going. If you are going to go disk “the back 40” then let someone know where you will be, should something happen or just to check in to make sure you’re ok. If you move to a different field, update them on your status. Cell phones and 2-way radios are fabulous communication tools. Don’t take “shortcuts”. They WILL come back to haunt you. Jumping across a moving PTO or trying to unclog the chopper while it is running are probably not the best ideas if you’d like to keep your limbs. Take the extra few seconds to shut off moving parts or engines. Be aware of your surroundings. Know where children or workers are before moving machinery. Know where field approaches, tile inlets, trees, barns, sheds, vehicles, drainage ditches and buffer strips are located, and make sure your help knows too. Having to replace machinery parts or fix tile inlets are never a cheap or fun task. Also, don’t text and drive! Eat. Drink. Sleep. Fatigue will sneak up on you and pretty soon you’ll be sleeping behind the wheel. Take a 20-minute nap when the sleep monsters start crawling all over you. Keep a jug of water with you in the tractor to stay hydrated and wash your hands if needed. Have someone bring you lunch or supper and keep a few healthy snacks (apples, granola bars, etc.) on hand to boost your energy. And, just get out of the tractor once in a while to get a breath of fresh air! Don’t wear loose clothing or strings. Too often you hear about a farmer getting caught in an auger or PTO because their sweatshirt strings got too close or their pant legs got caught in the gears. Take the sweatshirt or jacket off or remove hood strings before working in these conditions. Cut the fringes off pants and repair holes to reduce chances. Shut off PTOs and engine before working on moving parts. ‘Nuff’ said if you want to keep your fingers, arms, legs, and other important body parts. Use your lights and flashers. Many road drivers don’t heed to farm machinery as they should so be proactive and make sure they can at least see your lights. If you have machinery that has poor or no lights, only move it on roads during daylight hours and have someone follow behind you in a vehicle with their flashers on. Wear a dust mask and do not enter grain handling facilities that are being loaded or unloaded. Every year we hear about farmers getting trapped in grain bins. This is a big no, no. Grain is not safe to walk across, especially when it is in a bin and 20 feet deep. If you absolutely have to enter a grain bin, wear a safety harness and have another person or two nearby should the situation go bad. Also, grain gets dusty sometimes, wear protection, your lungs and airways will thank you. MVTV Wireless wishes our local farming families and Ag related businesses a safe and prosperous 2016 harvest! How will you celebrate National Nutrition Month (NNM)? If your body were a computer, would it be receiving lots of “error” messages? Is it beginning to run slower and take longer to “start?” Here’s a checklist to help optimize your performance and prevent crashing. Are you trying to run too many programs at the same time? Is your anti-virus software up-to-date and running? Is your battery dangerously low? Are you bogged down by unneeded files and programs? Remember, good health it’s just about what you put in your mouth. …it’s mind, body and soul. Recharge your battery before it loses power completely. Habit #7 in Stephen Covey’s The 7 Habits of Highly Effective People is “Sharpen the Saw.” Covey tells the story of a woodcutter whose productivity decreased after sawing for several days straight. Each day his saw became duller and duller. Covey advocates a balanced program for self-renewal in these four areas of your life: physical, social/emotional, mental and spiritual. eHealth isn’t just for the elderly. Consider purchasing a wearable activity tracking device, such as a Fitbit, Garmin or Jawbone. If you already have an Apple Watch, you may have activity tracking apps at that your fingertips. C/net.com did a wonderful write up on ‘Best fitness trackers of 2016‘. And in the months to come… Take time to visit a local Farmers Market with a friend or your entire family. For a list of Farmers Markets in our area, go to the MVTV Wireless Events Page. For other nutrition and wellness information, visit UNL Food’s Nation Agriculture Week blog. For information about Minnesota’s Public School lunch programs and policies, visit the MN School Nutrition Association website. MVTV Wireless wishes you and your family a happy and healthy 2016. According to the Minnesota Department of Employment and Economic Development (DEED) Press Release on December 31st, 2014, four of our local businesses will be expanding to the tune of 16 additional jobs in our area! ST. PAUL – Four small businesses in Minnesota are expanding with assistance from the Greater Minnesota Job Expansion Program, a new initiative that was launched this fall by the Minnesota Department of Employment and Economic Development (DEED). The businesses are PurNet Inc. in Worthington, Step Saver Inc. in Morton, and Monsanto operations in Olivia and Glyndon. They are planning to invest a total of $12.8 million on expansion projects that will result in 16 new jobs. In exchange, the four businesses will receive state sales tax refunds totaling nearly $550,000. DEED certifies businesses to participate in the program and will monitor them to ensure that they achieve hiring and wage commitments. Public utilities or businesses engaged in retail sales, lobbying, gambling, entertainment, professional sports, political consulting, leisure, hospitality or professional services are not eligible to participate. To qualify for the refund, a business must have operated in Greater Minnesota for at least one year and must commit to expanding its workforce at a single facility. The business must increase full-time employment at the facility by two employees or 10 percent of current employment, whichever is greater, within three years. The medical supply material management company is planning a $1.85 million expansion and will add five full-time jobs at $14 an hour. PurNet was awarded a state sales tax refund of $100,000, which it will receive over the next seven years. The manufacturer of salt products and mobile application delivery equipment is planning a $515,000 expansion. Step Saver Inc. was awarded a $50,000 state tax refund, which it will receive over the next seven years. The company will add two full-time jobs at $15 an hour. The provider of agricultural products is planning a $4.6 million expansion of its Olivia operations and will add five full-time jobs at $30.29 an hour. The company was awarded a state tax refund of $150,000, which it will receive over the next seven years. The provider of agricultural products is adding four full-time jobs at $24.04 an hour and spending $5.8 million to expand its facilities in Glyndon. The company was awarded a state tax refund of $250,000, which it will receive over the next seven years. DEED is the state’s principal economic development agency, promoting business recruitment, expansion and retention, workforce development, international trade and community development. For more details about the agency and our services, visit us at http://mn.gov/deed/ . Follow us on Twitter at twitter.com/mndeed . Great news for our small SW Minnesota towns!